Charlie Rohrbaugh’s new book “It's A Bear... And It's Coming...” is a creatively crafted and vividly illustrated adventure of hunting, travel and family. Recent release “It's A Bear... And It's Coming...” from Page Publishing author Charlie Rohrbaugh is both entertaining and suspenseful; this work narrates the author’s journey as he hunts in foreign countries and sees some of life’s most exotic creatures. 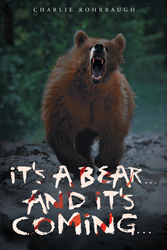 Charlie Rohrbaugh, a husband, hunting and fishing enthusiast, family-man, devoted writer and author, has completed his new book “It's A Bear... And It's Coming...”: a gripping and potent work about animals, survival, fear and success. Published by New York City-based Page Publishing, Charlie Rohrbaugh’s captivating tale is the perfect read for any hunting enthusiast but it will also fire the imagination of anyone with an adventurous spirit. What happens when an ordinary hunter is exposed to some rather extraordinary opportunities? From the first hunt in Canada’s British Columbia, it’s easy to see that the guides and supporting staff are the heroes of these adventures. Too often, they are the unsung and tireless professionals that make or break a hunter’s trip. In the end, it is their hunting prowess that makes for a successful hunt, whether or not an animal is taken. Rohrbaugh expounds, "It all begins in the wilderness of British Columbia on hunts for elk, moose, caribou and mountain goats. The sheer vastness of the wilderness and rugged remoteness of the region adds an element of difficulty and danger not normally encountered in other locales. Add to that the presence of the fearless grizzly bears prowling the mountains and things can get dicey in the blink of an eye. 'Some days you get the bear, and some days the bear gets you,' takes on an entirely new meaning as one starts the day, hoping today doesn’t fall into either of those categories. From British Columbia, the scene shifts to Wyoming for mule deer and turkeys followed by a whirlwind trip to South Africa for plains game. Barely back from South Africa long enough to do laundry, we headed off to Idaho on a spring black bear hunt. Two more trips to Wyoming followed for antelope and elk before heading back to South Africa for Kudu and Waterbuck. Between the last two Wyoming trips, our first grandchild was born and the second was on the way. That was the impetus for beginning to document the details of these trips." “Someday, hopefully our grandchildren will be able to read about my experiences with the same interest I used to read about others’ hunts when I was a boy. Then maybe, just maybe one or more of them will find their way out to where the wild things live to see, hear, smell and feel for themselves what it’s like to be truly alive and free.” concludes Rohrbaugh. Readers who wish to experience this mesmerizing work can purchase “It's A Bear... And It's Coming...” at bookstores everywhere, or online at the Apple iTunes store, Amazon, Google Play or Barnes and Noble.